Hands never appeared on an officially released album. However, Pat Humphries recorded a version for the tribute album, What’s That I Hear? : The Songs of Phil Ochs as well as on her solo album Hands. Jim Glover recorded a version that appeared in Fast Folk. Joe Jencks recorded a version that appears on Phil Ochs Song Night at Kerrville Folk Festival 2012. Covers of Hands may be found on YouTube. Hands appears in the Rise Again songbook. Lyrics as transcribed by Jim Glover. I’ve seen the hands of the miners digging out the coal. The black dust stuck to their fingers as they lived their life in a hole. Well I’ve seen the hands of the lumberjacks; forests swaying in the breeze. And the splinters stuck to their fingers as lumber was torn from the trees. And now the hand of the lumberjack is reaching out to you. And I’ve seen the hands of the farmers plowin’ across the fields. And the topsoil stuck to their fingers as the land was split by the steel. Just growing all they could grow, to fill your tables row after row. And now the hand of the farmer is reaching out to you. 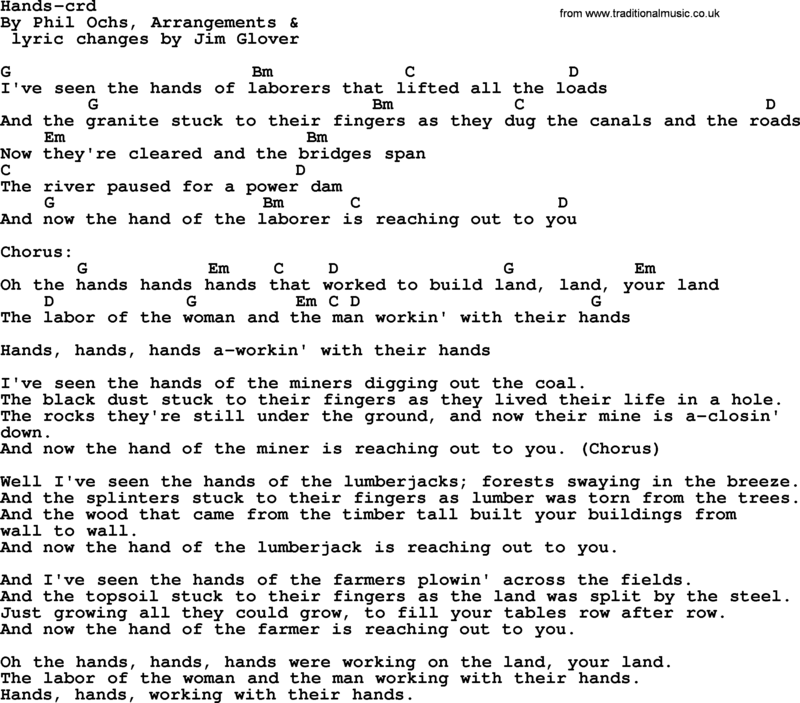 Oh the hands, hands, hands were working on the land, your land. The labor of the woman and the man working with their hands. Hands, hands, working with their hands. The following appears in SingOut! I recenty wrote a new verse “I’ve seen the hands of the Mother hanging out the clothes and the White flour stuck to her finngers a-rolling out the dough. Raising the kids and sewing the torn days of our lives since yoou were born… and now the hand of the mother is reaching out to you”.